Boo is new. And even if the other kids are welcoming, it can be scary being new, especially for a shy ghost who can’t play any of their games. 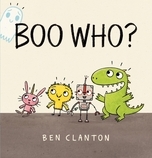 Can Boo find a way to fit in and make friends with the rest of the group? From the creator of Rex Wrecks It! comes a funny story about feeling invisible — and finding a way to be seen and appreciated for who you are. 32 / 6 7/16" x 6 5/8"